Hopelessly Devoted Bibliophile: Light Series: Interview with Lily & A GIVEAWAY! 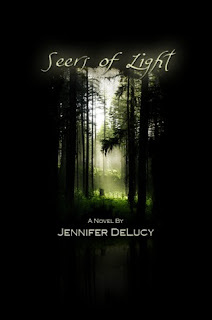 I am pleased as punch today to welcome Jennifer DeLucy to my blog! 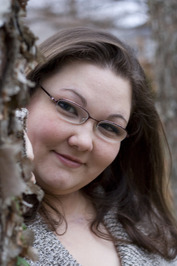 She is one of my favorite authors, and definitely a person of the highest caliber of sweetness. She is on a tour promoting the Light Series, which includes Seers of Light and Whisper of Light so far, with a third book coming very soon. If you haven't yet met William, Lily and the crew, you really need to read these books! Today I give you a glimpse into the mind of Lily, one of the Sentinents and also our fearless heroine in Seers of Light. Enjoy! 1) Hi Lily and welcome to my blog! If you had to describe yourself in a tweet (140 characters) what would you say? 2) What would you say is your biggest strength? Biggest weakness? 3) If you could give a message to the whole world, what would you like to say? Love! Love your life, love the people in it. Don't let fear stand in the way of being and doing everything that matters to you. Act from love, even if you make a fool of yourself sometimes. It'll still be worth it. 4) Okay, I know this is going to be tough but if you had to describe William in just one word, what would it be? 5) Is there a food that you simply cannot live without? Are you kidding? Heck yeah. Bread. I could so live on bread. 6) I know that when you first found out that you were Sentinent it was a little disconcerting, what would you say is the biggest benefit that you've found? Being awake. Living in awareness. I can't imagine going back to a life where I had to keep blinders over my eyes. There is so much more to our existence than people think, if they're ready and willing to see it. 7) Out of the new friend you've made, not including dear William of course, who would you say has made the most impact on you? I would say Clara Wright, for many reasons. She's been through so much, and yet her tolerance and patience and optimism and compassion are unfailing. When I think of all that she's seen and the losses she's suffered, it's amazing to me that she's still so loving and happy. I hope I can be like that. 8) What are your hopes for the future? I just want to be able to live in peace, continue to learn, and love as many people as I can. She never fails to inspire me, and neither does her fabulous creator, Jennifer DeLucy! Speaking of inspired, Jen has been kind enough to bring along a GIVEAWAY as well! Up for grabs are ebook copies of the Light Series books to one winner. Yup, you can WIN the Light Series and read it for FREE. To enter, just leave a comment below complete with your email address! Giveaway ends January 27th at 11:00 pm PST.